The so-called ‘boat people crisis’ in the Andaman Sea has been brewing for a long while. Economic migrants and refugees attempt the perilous sea crossing to reach safety and better economic prospects. This is the story of human migration: fleeing the undesirable and the dangerous while moving towards a better future. The recent events have brought to the world’s immediate attention the plight of desperate people willing to pay sums far beyond their means to engage the services of people smugglers in order to flee from their homelands. This is part of broader global movements of people to industrializing and industrialized countries in search of a better life; be it in Southeast Asia, across the Mediterranean or across the Mexico-US border. The current crisis in Southeast Asia derives from three key factors, two pushing migrants from their places of origin, and one pulling migrants into Malaysia. Many of the boats intercepted in the Andaman Sea were carrying Bangladeshis and Rohingya en route to Malaysia. For many Bangladeshis, poverty at home and the better earning potential in Malaysia leads them to seek out a smuggler. Among these Bangladeshis are those who have worked in Malaysia previously alongside new recruits who have been enlisted by friends or agencies. Rohingya, on the other hand, are fleeing increased violence, systemic discrimination and statelessness in Myanmar. This has been the case since the late 1970s and Rohingya have been steadily flowing into Malaysia for decades. Increased numbers of Rohingya arrive in Malaysia after eruptions of violence, such as in the aftermath of ethnic riots in Rakhine state in Myanmar in 2012. Rohingya fleeing to Malaysia gain a sense of protection as well as opportunities for paid work that will allow them to sustain themselves and their families. The Malaysian economy, with its vibrant manufacturing and construction industries, represents a significant pull factor for regional migrants and refugees. Indeed, these sectors are reliant on the cheap labor which illegal works provide. 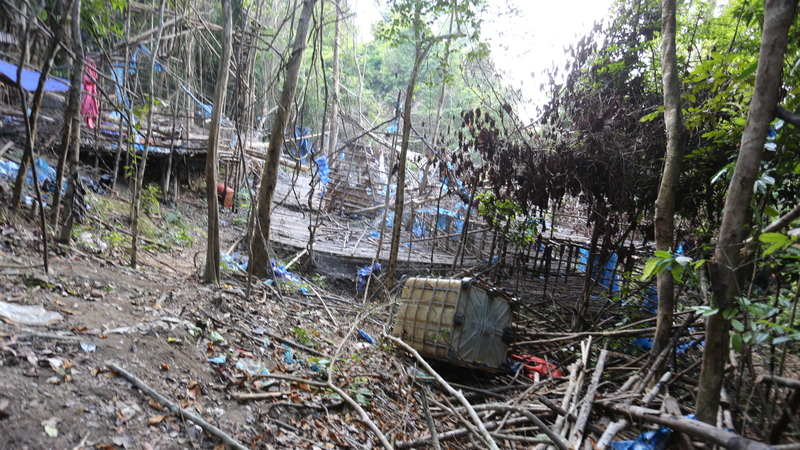 The majority of migrants and refugees in Malaysia find work in so-called 3D jobs: dirty, dangerous and demeaning. The local labor force is unwilling to perform this work and society could not function without them today. This makes work rights and the regularization of existing undocumented migrant and refugee workers an important task for regional labor destination countries, like Malaysia. The Malaysian government has no means of recording the numbers of undocumented people currently living and working in the country with estimates ranging from two to five million, in addition to the 2.2 million migrant workers residing in the country legally. Regularizing the status of refugees and providing them with work rights would provide the economy with a more stable workforce (less immigration raids), the government more taxes (no longer lost to the informal sector) and the workers themselves more agency and protection in the workplace (currently most have no insurance). Protection is indeed the first step in reframing the debate. We ought to talk of protection spaces for those persecuted and in immediate need of safe passage and safety. Malaysia is a first protection space for many refugees and with international help basic service provision for refugees can be significantly bolstered. At present the Malaysian government does not recognize refugees and does not provide them with any services. A protection space need not shoulder the current crisis alone and protection is an ethical and moral responsibility shared by all countries. To do this the global UNHCR resettlement program needs to be strengthened and more industrialized/rich countries urged to participate, especially within Asia. Japan, for instance, only began resettling refugees in 2010 and was the first Asian country to do so. In times of crisis wealthy countries often fulfill their responsibilities by committing monetary assistance. Qatar has pledged $50 million to assist Indonesia to house the recent influx of Rohingya refugees. This is helpful, but is usually expended on short-term projects, not used to address long-term issues. Beyond sending money, wealthy Gulf nations could offer sanctuary, especially for Muslim refugees, without joining the UN refugee convention – a document many countries are reluctant to sign and some signatories are trying to circumvent (most notably Australia). Indeed, Australia has set a dangerous precedent recently in paying Cambodia to accept refugees intercepted on their way to Australia. This is reminiscent of a proposal to create a market-driven refugee trading system, first mooted 21 years ago. An (illicit) market is already engaged in moving people across borders and economic market rhetoric should not be deployed as a redistribution tool for those people who some states deem ‘undesirable’. The complexity of these human migration crises is ethical, economic and political. The root causes are complex and mired in local, regional and global political stalemates. Big issues, such as rising inequality and poverty, propel people to seek better futures elsewhere. People persecuted for reasons of race, religion, nationality, membership of a particular social group or political opinion must be afforded sanctuary and protection. These are realities and responsibilities shared in a global sense. Naturally, addressing the underlying systemic issues takes more time, effort and political will, but if governments fail to act the ‘crisis’ will continue simmering until the next time it boils over. This entry was posted in anthropology, Australia, border, Malaysia, Myanmar, politics, refugees and tagged Australia, economic migration, Malaysia, Myanmar.